Happy Publication Day to the fourth book in Megan Tayte’s gripping The Ceruleans series, Devil and the Deep! To celebrate Devil and the Deep‘s release, you have the chance to get your hands on a bunch of The Ceruleans and bookish goodies include an awesome folly tote bag, an Amazon gift card and much more! Keep reading to find out how to be in with a chance of winning! For starters, there’s the isolation. Being a Cerulean among humans is fraught with risk, so her time with people can only be fleeting. Which means being with Luke but not ‘being’ with Luke. But what’s really pushing Scarlett to the precipice is something much bigger than herself, than her life in the cove. A force to be reckoned with: Blood. 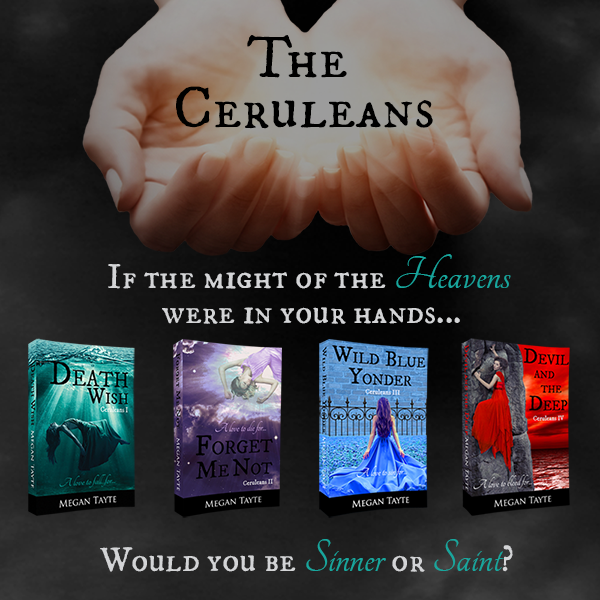 I can honestly say that The Ceruleans is one of my favourite paranormal romance book series and if you haven’t already, I highly suggest delving into these books. You won’t regret it. My reviews for the previous installments in the series can be found here. Devil and the Deep is available to buy here. If you’re a fan of a good bargain, head on over to Amazon right this second to take advantage of today’s free promotion on the other three books in the series; Death Wish, Forget Me Not and Wild Blue Yonder. If you’d like to be in a chance of winning some The Ceruleans treats that are bound to make any brighten any bookworm’s day, then simply follow the instructions on the widget below. Best of luck! Be sure to pick yourself up a copy of Devil and the Deep today!